best buy verizon Note 4 in WHITE pre-order still not in! i pre-ordered the note 4 in white from BB on 10/6, and it's still not in for verizon.. They have no idea when it's due in or why it's so late. anyone else still waiting? ETA? My wife and I pre ordered from BB on 10/11 and her white phone still hasn't arrived. She ended up settling for the black phone but they kept her pre order active in case it came in within the two week return period. I dont think they sent any whites to BB at all, at least not for verizon (the website shows 0).. its making me mad because there should have been 4 or 5 colors.. but we only got 2.. except one of those colors just fell off the back of the truck or something. 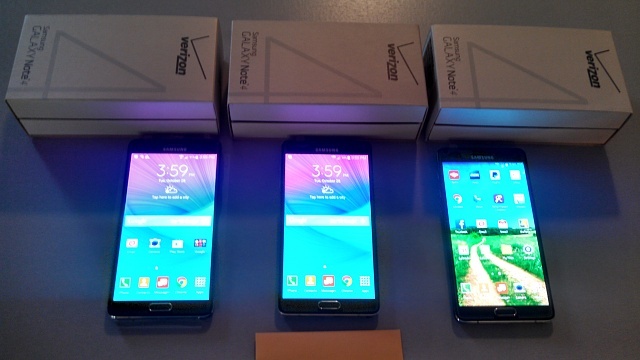 Now i have to probably sell my black one on swappa and then buy a off contract from the actual verizon store. There isnt even a guarantee the white one will show up at any best buy before the 14 days are up. I pre-ordered on 10/11 and after days of calling fruitlessly I decided to cancel my pre-order before the 15 day deadline so as to get my gift card refunded. I thought I would get one from Verizon earlier, but now I'm afraid I can't even get it by 10/31 which is the last day to claim the Samsung rebate. I even resorted to T-Mobile but they don't have the White either.. I got my white verizon note 4 from best buy on 10/24/14...a day later than should of but seeing how many people still haven't got theirs I'm OK with a day late. Yeah this is annoying. Still nothing, no e-mail. And just today I happen to drop my old phone, with the screen shattering and all. Of the multiple times I've dropped it, why must the screen crack this time! Now I really have a reason for BB to hurry up. I don't understand the low availability of the Note 4. I guess Samsung's flagship is the S5 but this is their best device to date IMO. I was going to get the S5 until i really did some research on the Note 4 (i was reluctant to go bigger ). Anyway, i decided i wanted the Note on the Sunday after it came out. I must have called every Sprint, Best Buy, and BB mobile and of course no one had one! So i ordered online through Sprint that night. But when i went to get a case on Monday, my sprint store said they'd only received 1 white and 1 black phone! How does this happen? Why wouldnt more be produced /shipped? I preorder on 10/12 for white note 4 Verizon. Best buy can't tell me anything they are absolutely clueless. All they will say is it is awaiting inventory and will e-mail me when it is ready.. The white will be in Best Buy stores on Saturday 11/1, possibly Friday 10/31. I got 3 black ones from them, so I trust them, thus far. Well that's assuming; it better at least be in by this weekend! Or bye bye Best Buy. I've waited long enough. How do you know they will be in on those dates? Because I have a preorder for a frost white Verizon note 4 that still isn't in and I need to make a choice to cancel my preorder and try to get a black one at Best buy if I can find one by Saturday before the 200 Best buy trade in offer runs out. Because they told me at every store I called that once that promotion ends on Saturday the 1st they will not give me anything off my preorder once it does come in which I'm very pissed about. I have no control when the phones come in so why should I be screwed out the 200 best buy gift card. My best buy that I got 3 notes from so far has given me 100% correct information when it came to the Note 4 release date etc. They told me it will be in possibly tomorrow but definitely Saturday 11/1. After dealing with 8 best buys in my area I have learned that every best buy is different. I found one that has been reliable and always given the right info so I have stuck with them. gf has a white verizon note 4 on pre order and best buy and they have no idea when they are getting them in. It's been quite frustrating especially since they entered the email wrong and cannot change it. I pre-ordered my White Note 4 through the Verizon website about a week ago, and when I got the confirmation email it stated the device would ship tomorrow, 10/31. However, I called Verizon today about changing my Data plan and I inquired about my order and was told they are showing in their system that it will be shipped December 13th. I asked why and of course they didn't know. So the rep escalated my call to a "supervisor" who also told me that my order won't ship until 12/13. I'm thinking of canceling and just going for the black one. yeah I have two black one and they look nice my wife originally wanted a white one but she's fine. The black one is more of a grey to be honest. indiansfan78 and yorusama like this. man!!!!!!!!!!! I just called my local verizon store and they have it in white! Should I go ahead and get it on edge so I don't have to pay anything or wait until saturday when it comes out at best buy and get the 200.00 gift card???????????????????? I would wait .. a few day wait to get +$200 ? Yeah . True. I called several verizon stores and they all have it in white and black. Maybe I'll buy it from verizon and then get it from best buy on saturday once it comes in...just in case they dont get it in...i have 14 days to take the verizon back anyway. You're welcome to do whichever but I personally would just wait and get the $200 + the phone without any returning or anything -- The 14 day return will have a restocking fee attached if you do that (you have to return in 3 days or less to not incur the fee) --- You'll likely be happier once you have the phone and the $200 in your hand. It will be worth that few day extra wait. whph28 and yorusama like this. I posted to twitter and got a rep who tweeted to me that BB will honor the promotion for us. Post a tweet to BBsupport and see what they tell you. I was told the same thing on Twitter! I have it on my phone so hopefully that will be the proof the store needs. I am hoping the Galaxy Edge gets here before the Note 4 so I can swap out for that phone instead! Can anyone help me update my Galaxy S4 Active (i537) to 4.4?